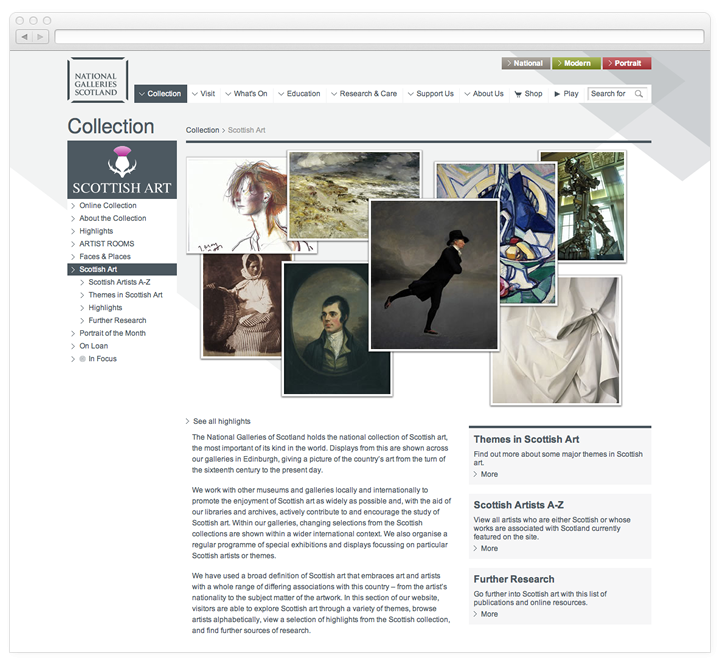 Keepthinking has designed and developed the entire web presence of National Galleries of Scotland since 2004. 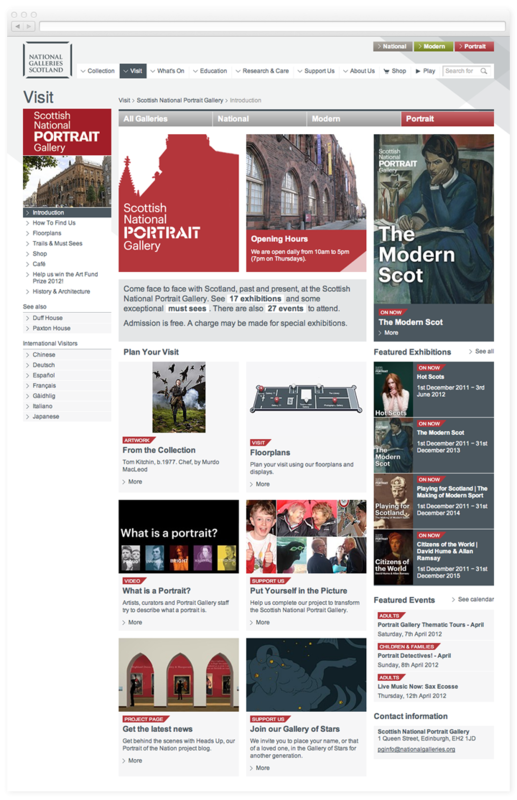 In October 2011 a completely new look and information architecture for the website has been launched, to coincide with the re-opening of the refurbished Scottish Portrait Gallery. 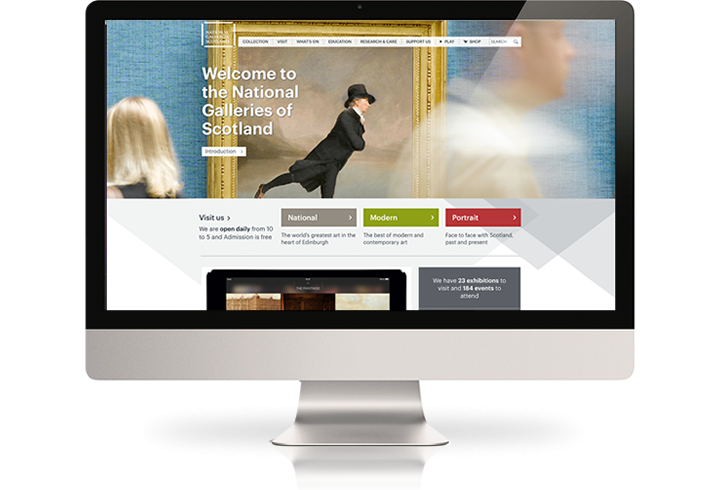 The site reflects the new brand of National Galleries, together with a new focus on the individual sites of the National Gallery, The Modern Art Galleries and the Portrait Gallery. We worked with NGS for over eight years. During this time, the aims and messages of the organisation have changed on several occasions, shifting from promoting unity to embracing diversity; from concentrating on exhibitions to re-centre on their own collections. Having Qi as a content management system has ensured smooth transitions between any of these changes. NGS uses Mimsy XG as a Collection Management System. 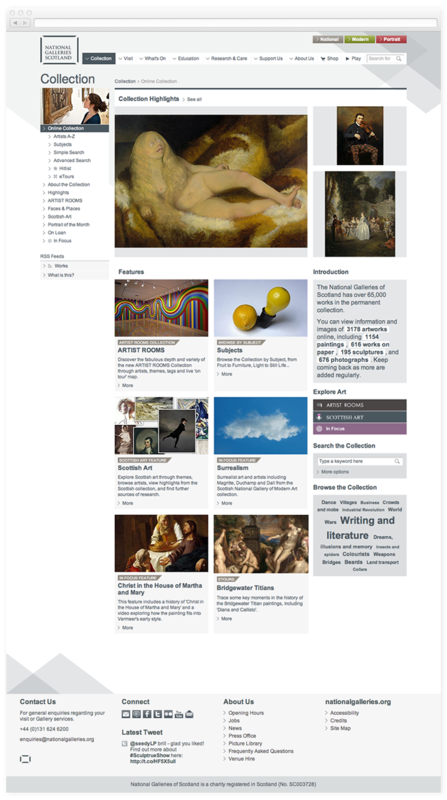 Qi as a CMS integrates with Mimsy to display collection objects and add multiple contextual information to them. 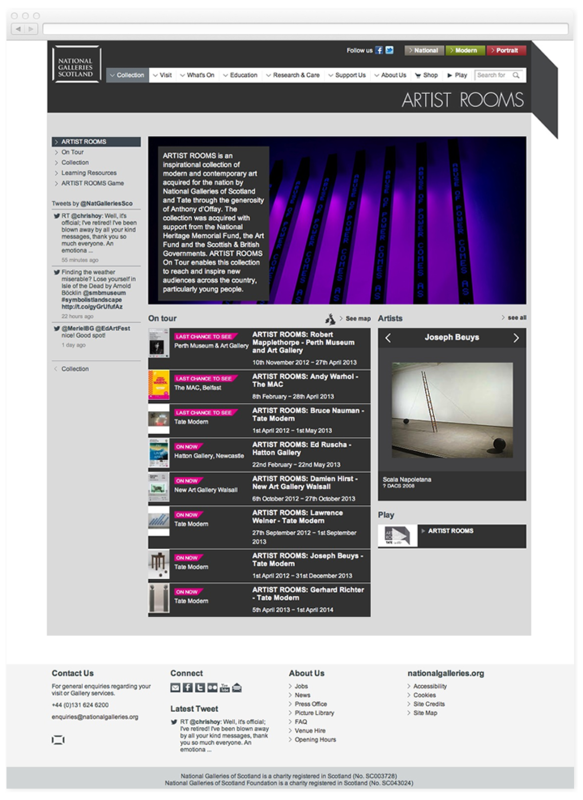 The design of the site allows for sub-brands or special features to be accommodated within the main design identity. Within QI, the In Focus features offer NGS the possibility of creating completely independent micro-sites that can be linked from anywhere on the site. There are also fully branded sections like the Artist Rooms which present a unique collection and it's touring exhibitions. 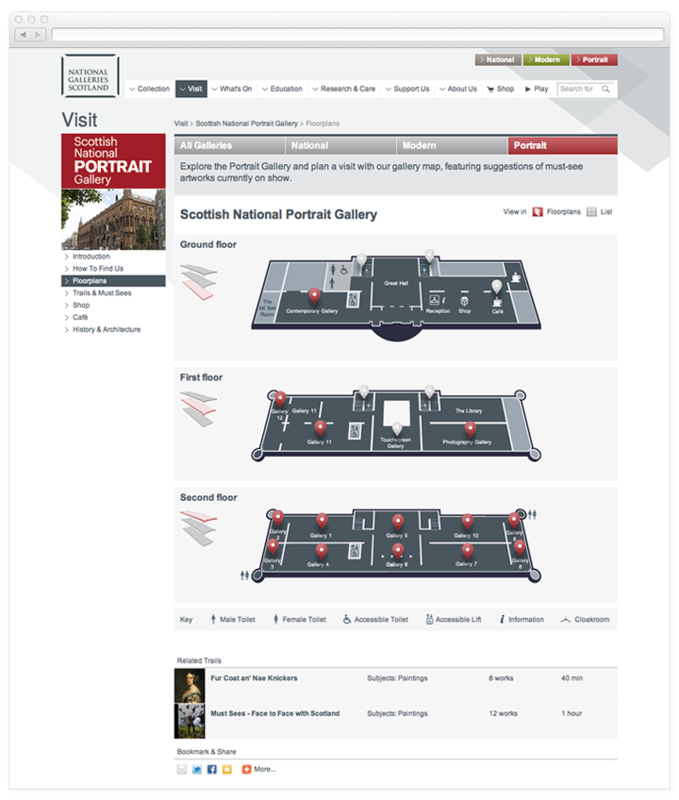 NGS includes three main sites and seven buildings in Edinburgh, plus two extra locations in other parts of Scotland. 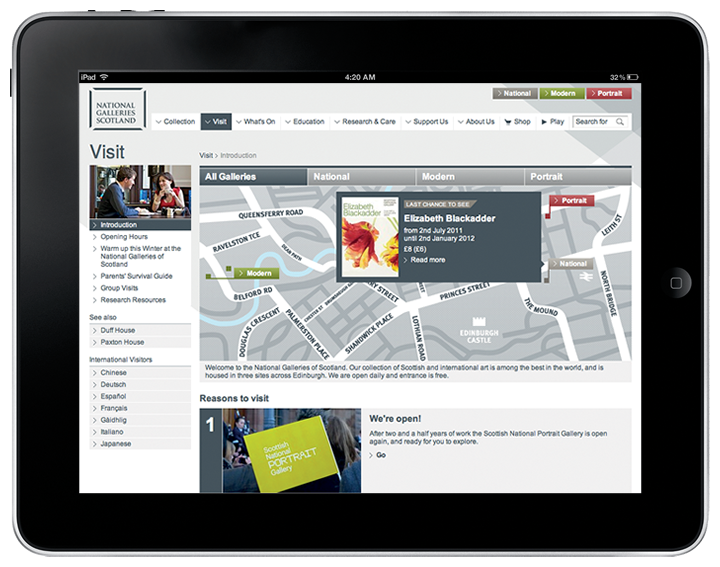 The Visit section must let visitors understand this complexity, explain the integrated view of the galleries and display the unique features of each location. 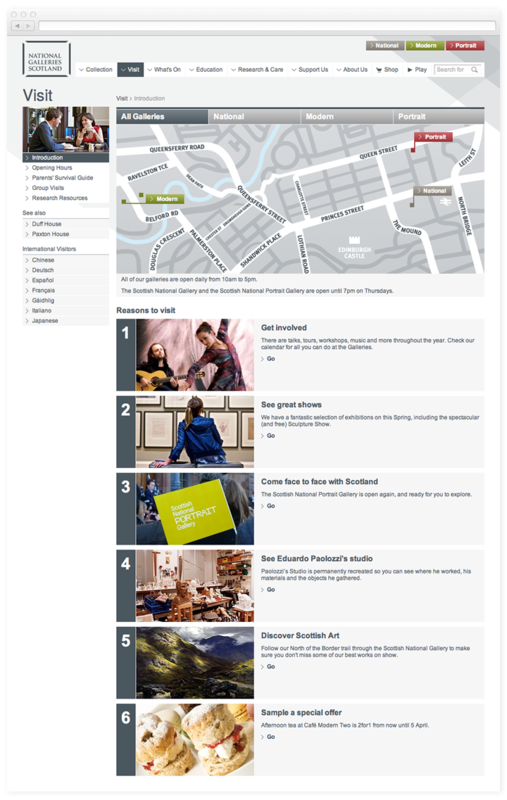 Each main complex in Edinburgh has a landing feature, or 'hub', which shows everything at a glance: the building, highlights from the collection, exhibitions, events, restaurants and more. Each building can be fully explored using the interactive floor plans, linking to facilities and highlights from the collections in every room. 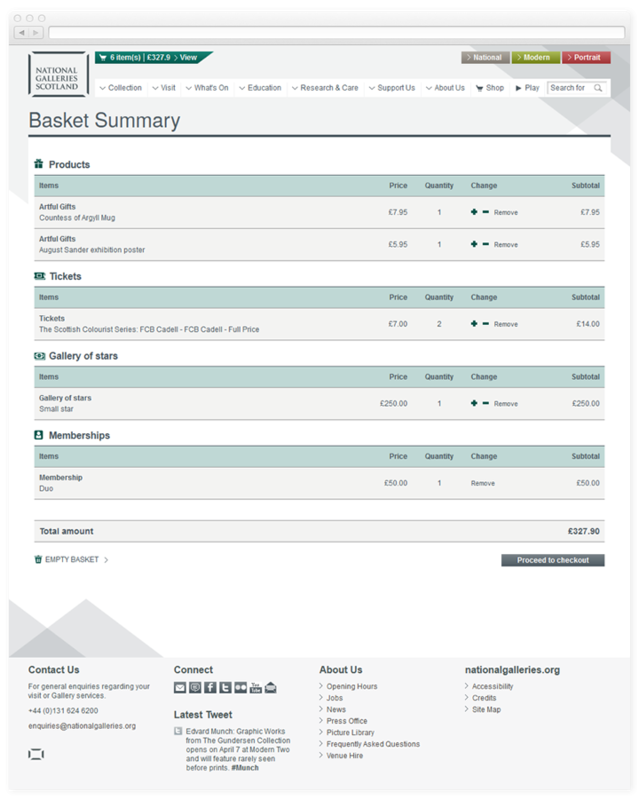 Unique in the entire museums scene, NGS's e-commerce activities are dealt with one single, integrated basket. 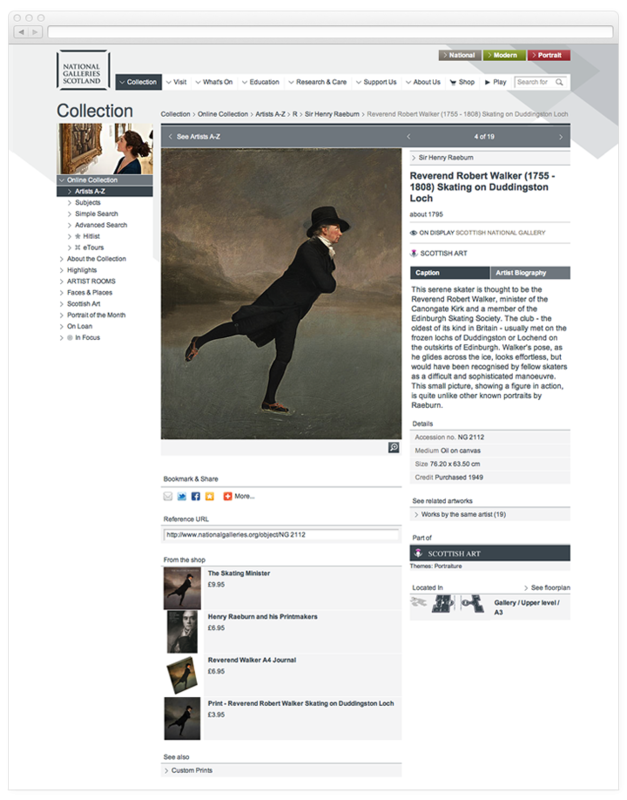 Visitors may buy tickets for an exhibition and its catalogue, make a donation and become friends, by adding each item to the same basket and paying using a single transaction. Qi splits the order according the the required departments, to allow for separate fulfilment. The site has been fully tested on iPad, iPhone, Blackberry and Android devices.